Israel has always been a place of pilgrimage—for history, faith, politics, and partying. But now that first-rate hotels, globally celebrated chefs, and forward-looking design are on the rise, can the country establish itself as a destination for more urbane pleasures? It is 1:15 a.m. and I am cowering in the shower of my elegant bathroom at the Norman hotel in Tel Aviv. I have gotten out of my bed with its slightly scratchy linen sheets because a warning siren has suddenly pierced the night’s quiet. The hotel has a shelter, but it is across the courtyard, and I am not sure whether I will have enough time to get there. After envisioning scenes of bloodshed and carnage for minutes on end, I eventually calm my agitated nerves by calling my sister, who lives in Jerusalem, on my cell phone. She advises me to stay where I am and assures me that the siren will eventually stop. I have come to Israel to explore the question of whether luxury has finally come to a country known for its brusque attitude toward visitors, only to find myself worrying whether I will ever see my daughter again. Such is the life of the intrepid reporter. I have been traveling to Israel for almost half a century, beginning with a family trip one summer in the mid 1960s. We were booked on one of the first sailings of an upscale kosher ocean liner called the Shalom, which featured, to my great excitement, a separate tearoom and a movie theater that screened, among other offerings, Come Blow Your Horn, starring Frank Sinatra. We arrived in Israel after a two-week sail, stopping along the way in Marseilles, Rome, and Málaga, and I can vividly recall how strikingly exotic that tiny Middle Eastern country seemed to me. I can specifically remember biting into my first falafel-stuffed pita, bought from a street vendor in Tel Aviv, and also my disappointment that there was not a hot-fudge sundae anywhere to be found. Left: A classically Bauhaus building in Tel Aviv. 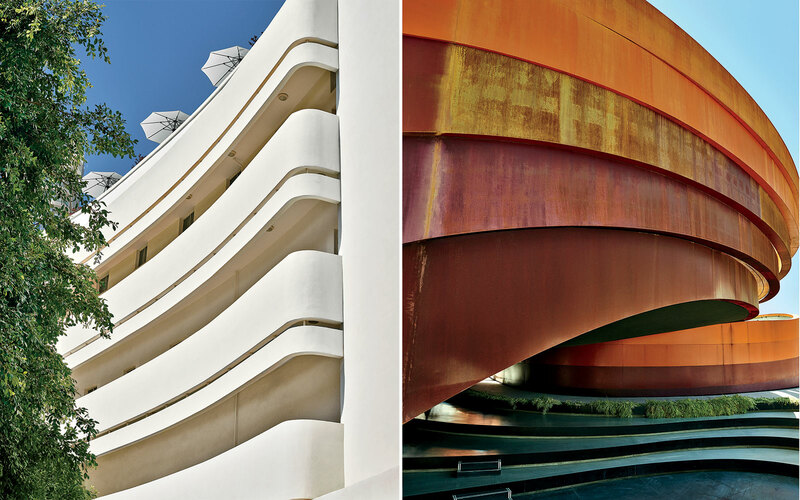 Right: The Design Museum Holon, by architect Ron Arad, an emblem of the country's growing sophistication. Truth be told, back then it was hard to even find decent ice cream. Those were the pre-foodie decades, long before Israel had vaulted onto the global culinary scene and spawned celebrity chefs and world-class restaurants. In those days, Israel was still a young nation, working hard to create a land of milk and honey (as the popular song had it) out of its inhospitable desert environs. Although a vibrant tourist industry was already in place, with hotels serving sprawling buffet breakfasts and knowledgeable guides on hand to show you every sandy, sightsee-able inch, the concepts of genuine luxury and impeccable service were still alien to the casual Levantine approach. This would remain the case for the next few decades, as I came to realize upon my frequent visits. A five-star hotel in Jerusalem or Tel Aviv wasn’t anyone’s idea of a five-star hotel in London, say, or Paris. The intention may have been there, but the execution generally faltered: there were too many wrinkled cloth napkins and too few poolside chairs. With rare exceptions, I don’t think I ever saw a bud vase on a room-service tray or a good-night chocolate on a pillow. This state of affairs was attributable to a number of factors. First and foremost was the reality that Israel was not only a relatively new nation but also one that had started as a socialist dream in which everyone danced the hora together and no one waited on anyone else. A rough-and-ready collectivist ethos defined the cultural style, and too much pampering or politesse—whether from an El Al stewardess or a bellhop at the King David Hotel—was considered suspect. Then, too, its visitors were mainly drawn from a captive audience of sorts: Jews committed to the Zionist cause. They were willing to extend to the country the benefit of every doubt, especially when it came to its take-it-or-leave-it service as well as the occasional gust of a particularly Tel Avivan form of snootiness. Israel was a place you came to for many reasons—the pervasive sense of history, the beaches, the pungent taste of hummus and the glimpses of antiquity—but it was hardly the setting for bespoke pleasures, delectable cuisine, or high-end amenities. It would take more time, a more ebullient domestic economy, and a more demanding international clientele before Israel came into its own as a destination worthy of even the most sophisticated traveler. A rough-and-ready collectivist ethos defined the cultural style, and too much pampering or politesse—whether from an El Al stewardess or a bellhop at the King David Hotel—was considered suspect. My American friends unanimously expressed trepidation at my going to Israel at such a charged moment in the region—to report a lifestyle piece, no less—but I’ve traveled to the country at other precarious times. And besides, given the volatile state of the Middle East, there is perhaps never an ideal time to visit Israel. The laws of predictability don’t really apply here. Although the Israel I arrived in at 6 a.m. on a Tuesday in the third week of August hardly had a war-torn appearance, there were discreet indications that this was not a shining hour for the country’s image as a vacation spot. The flight over may have been full of the usual black-coated Hasidim and wailing babies, but the line marked foreign passports in Ben Gurion Airport was conspicuously short, and there were two bomb-shelter signs posted en route to the baggage carousel that I hadn’t noticed on my previous trip. The cabdriver who took me to my hotel in Tel Aviv—garrulous, as most Israeli cabdrivers tend to be—told me that he hadn’t seen a tourist in weeks. The hotels, he went on to inform me, which were usually 80 percent full at this time of the year, were down to 20 percent occupancy. None of this, I soon discovered, seemed to get in the way of the nightlife in Tel Aviv, which was going full tilt. Nor had it gotten in the way of the opening of the city’s ambitious new 50-room hotel, the Norman. From the minute I stepped past the security guard manning the entrance into the Norman’s intimate, period-style lobby, anchored by a huge welcoming bouquet of fragrant white flowers, I could tell that I was in for a qualitatively different experience from any of my previous hotel stays in Israel. (When my American-born niece Erica came to visit me at the hotel, her first comment, said in an entirely admiring tone, was: “But it’s so un-Israeli!”) It had something to do with the gorgeously uniformed, eager, and multilingual staff at the reception desk—something to do, as well, with the air of luxe, calme, et volupté that seemed to infuse the place. Olivier Heuchenne, the hotel’s Belgian-born manager (he has since been replaced by his able second-in-command, Yaron Liberman), came to the Norman after 16 years with the Ritz-Carlton, and he passionately believes that, despite the evidence to the contrary, “hospitality is within the Israeli mentality.” He explained that the Norman’s mantra is that “we all do luggage,” and to this end, he handpicked a staff that gets on-the-job training in the ethos of gracious service. The hotel is on Nachmani Street, a short walk from the beach and from the throbbing cultural heart of Tel Aviv, which is filled with galleries, museums, designer boutiques, and restaurants. It consists of two historic buildings that date back to the British Mandate of the 1920s, the main one abounding in gracious Oriental touches and the other of a more streamlined Modernist provenance. Both structures have been meticulously preserved and updated, with polished oak floors and a stone staircase with iron balustrades in true old–Tel Aviv style; the buildings are connected by a citrus garden, which is a calm oasis, interrupted only by Bing Crosby’s crooning, in the middle of an otherwise bustling area. A pointillist care has been taken with details, whether it’s the covetable pens made of wood used at reception or the oxblood-leather holdalls by Aspinal of London and the delicate nosegays in the rooms. 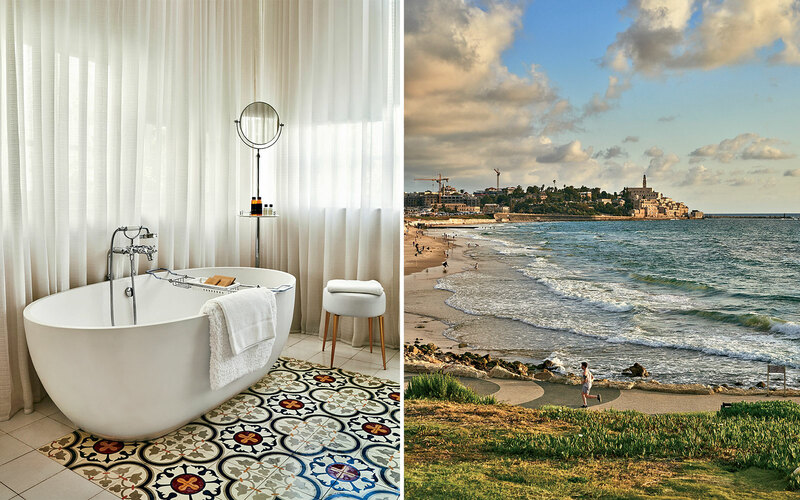 Left: A bathroom at the Norman, Tel Aviv's game-changing hotel, which occupies two historic buildings. Right: A view of Jaffa, in southern Tel Aviv, from one of several Mediterranean beaches in the city. Perhaps it’s a testament to how much of Tel Aviv has taken on a monied swagger, but unusually for Israel, the Norman has its own 40-car garage, a rooftop pool with views of the city, and a wide-ranging collection of contemporary Israeli art. Best of all, for those who have tired, as I have, of the typical mile-long Israeli smorgasbord breakfasts of herring, cheeses, and Israeli salads, there is an à la carte menu of eggs Benedict, sides of crispy bacon, croissants, and to-die-for French toast. You can almost feel the newfound culinary energy bouncing off the walls in Tel Aviv. In fact, food is really what the story of the newly upscale Israel hinges on—specifically the way in which Israeli cuisine has not only been invigorated in the country itself but has also passed beyond its borders to influence cooking and chefs in Europe and America. Yotam Ottolenghi, who grew up in Jerusalem and set up his first gourmet deli in London’s Notting Hill in 2002, is the most celebrated of the country’s chefs. And in many cities around the world, Israeli cooking has taken hold of the public’s imagination. Witness the haute pan-Mediterranean cuisine of Manhattan’s Bar Bolonat, along with the simple pita-and-hummus joints that are all the rage in New York and Paris. You can almost feel the newfound culinary energy bouncing off the walls in Tel Aviv. On my first night in the city the folks at the Norman snagged me a hard-to-get reservation at Shila, a hot spot on Ben Yehuda Street. I’ll admit that almost everything I and my dinner companion ordered sounded more tempting than it actually tasted. But the one dish that stood out—as it did at every other restaurant I tried—was the broiled chicken livers. Perhaps this is because they are part of the collective palate, developed by generations of Jewish mothers (including my own) who served an appetizer of chopped liver on Friday nights. At Tzfon Abraxas, a jumping place helmed by chef Eyal Shani, you can even get an order of chicken livers served up ingeniously in a brown paper bag. The city has plenty of trendy watering holes, too, where cuisine is almost beside the point. One evening I went with friends to Cantina, where models, actresses, and business moguls (of which Israel has its fair share, created mostly by the tech industry) paraded by the tables. The food is your basic spicy Italian, but what fascinated me about the place was the visual diversions: the bats that swirled in the trees that line Rothschild Boulevard, well-dressed and mostly pencil-thin women huddled in conversation with powerful-looking and less-thin men, just as you’d see on Madison Avenue or in the Hamptons. One of the best meals I had in Tel Aviv was not dinner at one of the sceney boîtes but rather lunch at Manta Ray, set on the promenade between Jaffa and Tel Aviv, overlooking the sparkling Mediterranean. I went there with Yaniv Stainberg, who runs Privilege Tourism, a high-end travel agency in Israel. He admitted that Israel is still being educated in the luxury experience, with the help of two hotel schools, one in nearby Herzliya and the other in northern city of Haifa (although he noted that the best hoteliers still study in France, Switzerland, and America). We discuss the must-see destinations, which for him include the Ritz-Carlton, in Herzliya. “It’s the best hotel in Israel by the standards of service, the size of the rooms, its location on the beach, and its spa,” he said. Even though the hotel serves only kosher food, as do most hotels in Israel, the chef has managed to transcend the given limitations of this cuisine, which prohibits, among other things, serving dairy ingredients with meat dishes. I had a superb steak at Herbert Samuel, a branch of the famed Tel Aviv restaurant at the Ritz-Carlton, followed by a delectable and elaborate bittersweet-chocolate concoction. 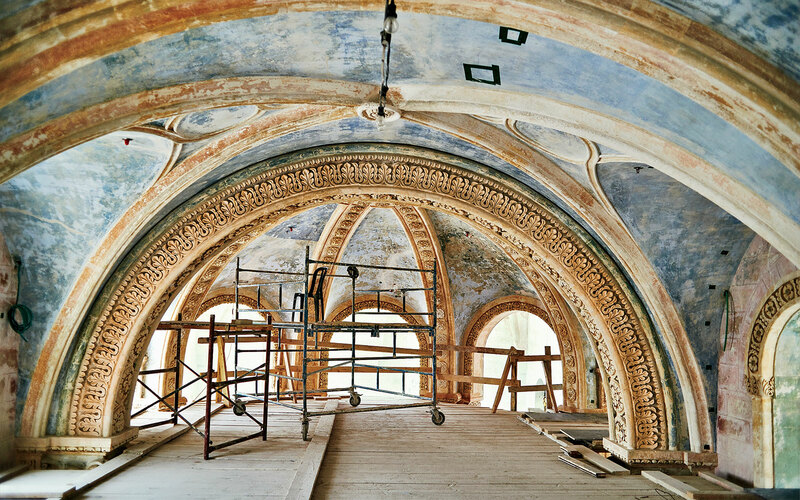 Renovations are under way in a heritage building in Jaffa that will become Tel Aviv's first W Hotel. Manta Ray is an attractive, open space, with areas for indoor and outdoor dining—decorated, farmhousestyle, with baskets of lemons, eggplants, and red peppers. As Stainberg and I bit into delicious roasted eggplant, Ofra Ganor, the restaurant’s ebullient proprietor, joined us. Ganor, who was early in recognizing Tel Aviv’s potential as a food scene— at a time when fresh herbs were still hard to come by in Israel—points out that the idea of “farm-to-table” always existed here, in part because the excellence of the produce mandated this approach. “Our tomatoes, figs, and eggplants are better,” she said, then ordered us a platter of meze: sardines, tahini with cauliflower, salmon tartare, tzatziki, goat cheese with beets, and shrimp with mango and spinach, all accompanied by house-made Balkan bread. From there we moved on to the seafood (the restaurant’s specialty). In a spirited conversation, we learned from Ganor that seven members of her staff were away on military duty in Gaza. This was a reminder of the larger, darker situation (matzav, as it is referred to here) in which Israel finds itself—something that can be easily forgotten while sitting at a beautifully set table by the sea. As someone who follows and has written about fashion, I was struck by the huge strides Israel has made in that industry. There’s a renewed emphasis on domestic manufacturing, and the country recently relaunched its Fashion Week. 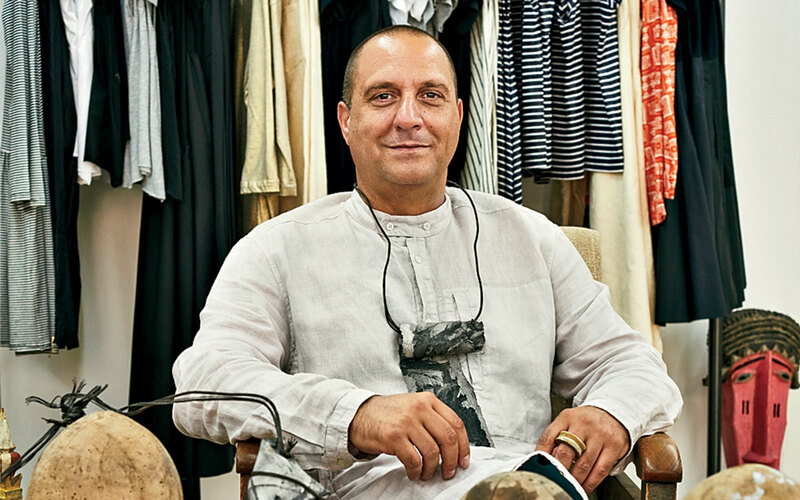 One of the most original designers, Kedem Sasson, who describes his aesthetic as “Middle Eastern Zen,” creates artisticlooking, almost Cubist clothes that borrow from a variety of influences, ranging from Japanese to French, while making them entirely his own. By chance I heard that Sasson, who has boutiques in Tel Aviv and Jerusalem, had decided to open a new Tel Aviv store a few months earlier, featuring a limited-edition capsule collection, as a 50th birthday present to himself. I rushed over to the shop on an out-of-the-way street in the Gan HaHashmal neighborhood to check out the clothes, which are sewn by women in two nearby factories, and to meet with Sasson, who looks a bit like a well-fed monk. The designer has none of the auteur-like airs about him that I associate with other practitioners, and I was, as always, impressed with his drapey, forgiving shapes and unexpected use of texture and color. Dorin Frankfurt is another successful Israeli designer—her motto is “Luxury at affordable prices”—and her relaxed, layerable designs, which are made locally, are made out of everything from denim to neoprene. She opened her first factory in 1985 “with no customers,” but three decades later her designs are carried in namesake stores all over Israel. I went to visit Frankfurt in her Tel Aviv studio, which includes its own warehouse and shipping operation, a yoga room for employees, and several resident cats. “Life in Israel is my inspiration,” Frankfurt told me. “We work in times of war and peace.” She said it took a while for Israelis to understand the finer nuances of fashion, but they have begun to catch on: “Everyone has clothes,” she pronounced. “There’s no reason to buy new ones unless they’re singular, beautiful, and work for you.” Given that Israel has proven to have its share of gifted designers, it makes sense to me that Israelis, who for the longest time seemed to dress in some version of the khaki garb that they wore while serving in the military (duty is mandatory for both men and women), would finally catch up with the fashion moment. Left: Home design offerings at Seti, a boutique in the shopping district of Neve Tzedek. 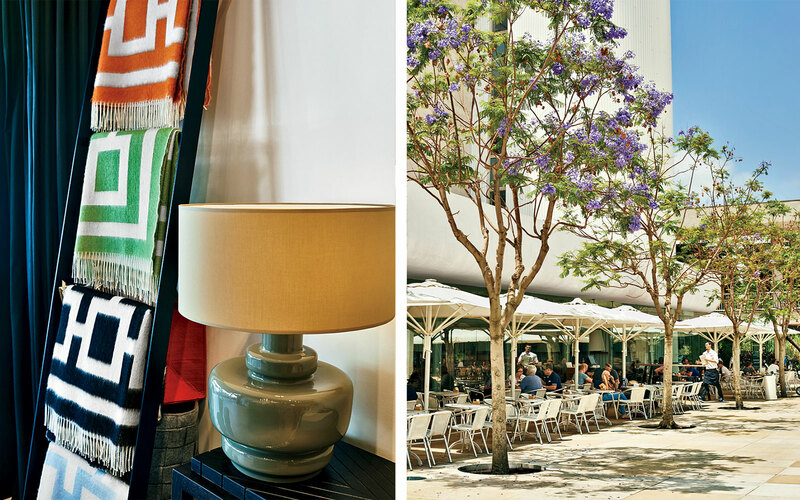 Right: Outdoor dining at a café on Habima Square. Much of the city’s stylishness reveals itself in Neve Tzedek, a gentrifying neighborhood with tiny boutiques and cafés on Tel Aviv’s southwestern tip. Until the late 1990s, I was told, taxi drivers refused to go there, but nowadays the area has the antibourgeois cachet of a little SoHo, and behind its nondescript façades are some of the most expensive apartments in the city. On Shabazi Street alone you can find Zozi, a jewelry store owned by a 38-year-old psychology major who took up goldsmithing, a stone’s throw from a shop called Seti that carries items that are the furthest evolution away from the down-toearth sabra mentality that I once thought of as characteristically Israeli. These include candles from L’Artisan Parfumeur and Cire Trudon, Lucite trays from Alexandra von Furstenberg, Czech glass from Sklo, and coffee-table books galore. If you wander around, as I did, you will stumble onto Numéro 13, a concept store carrying European brands run by Elise Shnaiderman, an enterprising young Parisian who moved here in 2006 and insists that Tel Aviv was a “fashion desert” when she arrived. All the same, she admits that Israelis “learn very fast in every domain” and that they are as “size-obsessed” as the women who shop on Rodeo Drive. I left the world of slender Tel Avivan ladies who lunch to check in on Jerusalem, where the women, in my experience, tend to come in all sizes and dress in a mishmash all their own. At the recently opened Waldorf Astoria hotel, I saw that along with the new luxury comes a certain amount of new glitz, verging on garishness—as true of Israel as it is of most places, of course. The hotel is a hymn to chandeliers and marble and rooms that look glam in a beige-on-beige, Dynasty-era kind of way. The most striking part of the hotel is its original ornamental façade, which dates back to 1929, when it fronted one of the first luxury hotels in the Middle East. Today it’s popular with Haredi Jews, who come from Europe and America to partake of its kosher cuisine, Shabbat elevators, and streamlined opulence. The Arab concierge who showed me around disclosed that plans are in the works to build separate swimming pools for men and women, in keeping with Orthodox custom. I was musing to myself about this unique approach to luxury tourism when the concierge abruptly interrupted his spiel to ask me for advice on his love life. I wasn’t sure whether he saw me as an old hand at romance or simply as an older woman who had reserves of life wisdom to draw on, but I stood in the lobby, with its Ottoman-style lamps and overstuffed couches, and had an impassioned discussion as to whether or not he should pursue his old girlfriend. Only in Israel. For my last two nights in the country, I stayed in one of the newly redone suites at the King David. The room was enormous and extremely comfortable, but it was the sloping garden, with a pool overlooking the Old City, that I found most transporting. I sat there one afternoon—children chattering and splashing in the pool, no Apache helicopters hovering overhead—and reflected on how much had changed in this exhilarating, exasperating, and heartrending country that I have known for 50 years. While tensions in this part of the world may continue to flare, Israel as a society seemed on this visit to have evolved, matured—as though the comforts it offers a visitor are a reflection of the pride it takes in itself as an international presence. I thought about the unexpected chic of the Norman and the ambitious cuisine of Shila, and then I remembered what was in fact my favorite meal of the trip: the falafel I bought at a stand in the central bus station of Beersheba. The mixture of chickpea balls, tahini, fried onions, and marinated eggplant stuffed into a pita was nothing less than sublime—like that first falafel I had as a girl. It put me in mind, for some reason, of Gerard Manley Hopkins’s wonderful poem “Pied Beauty”: “Glory be to God for dappled things…. All things counter, original, spare, strange.” It seems a fitting epigraph for a country that straddles so many disparate impulses, one that still hasn’t figured out how to spell lox on a breakfast menu but claims more than 200 boutique wineries. Mazel tov!